We'll start the solo with holding a double stop - the notes C and E on the G and B string. Hold it and give it a just very slight bend at the end and land on A on the D string. Next we go into a really interesting double stop phrase where we'll do a lot of rhythmic hits going between the double stops. Notice the little bend in the beginning of the lick. You're going to notice that - in true Soundgarden fashion - this solo has a lot of very different rhythmic elements to it, and the next lick is no exception. Take time and listen to what this phrase actually sounds like. It may seem easy at a glance but really try to pay attention to the subdivisions here. 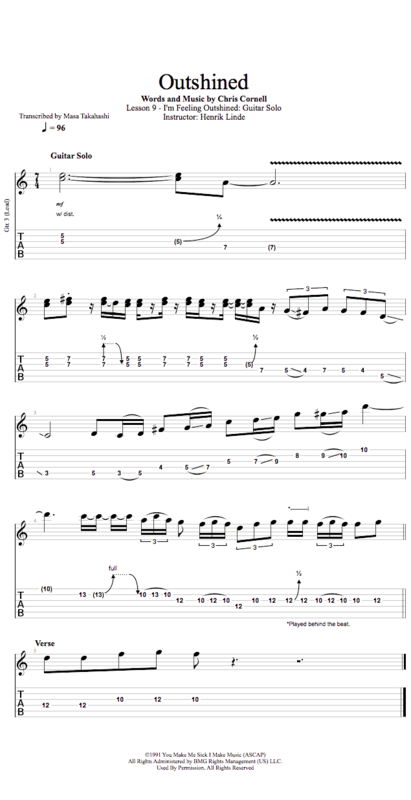 Next up is an ascending line leading into the closing lick of the solo. What you're focusing on here is going from down low on the neck, almost by the headstock. You're aiming for D on the 10th fret of the high E string. So as you go through the notes, remember that each slide I'm showing you is part of the sound to get you where you want to go. The closing lick is a quick little thing that is, again, very typical for Soundgarden's lead guitar playing. 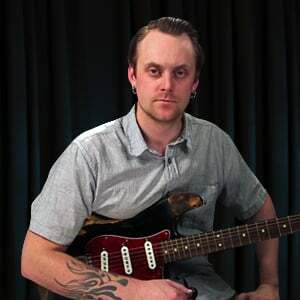 Some fast hammer ons and quick bends into fast pentatonic licks, gotta love that!